This Mutton Roast / Varuval is an aromatic mouthwatering recipe make with freshly ground spices and slowly roasted on a iron pan. 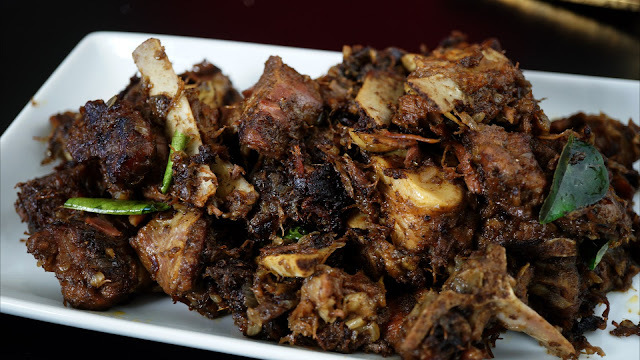 This recipe can make you extremely addictive and the taste lasts in your taste buds for ever.The method we cook makes the mutton to stay tender and soft.I can guarantee you that this tastes far better than the one which we order in the restaurants. Lets see how to make this delicious Mutton Roast. Step 1) In a pressure cooker add the mutton pieces,some salt and Turmeric. Then add some water not too much just to cover the mutton pieces.Cook for 4-5 Whistles on a medium heat or until the meat is soft and tender. Step 2) Dry roast Cinnamon, Cardamom, clove, star anise, fennel, cumin, pepper, green chilies, red chilies, ginger , garlic , shallots(small onion) , Curry leaves and coriander leaves and roast it for some time until you feel the nice aroma of the roasted spices and be careful no not burn them. Step 3) Transfer all the roasted spices to a blender and grind it to a smooth paste by adding some water. Step 4) Heat oil in a pan and add the Onions and cook until they are golden brown. Now to this add the broth which we have separated from the mutton after cooking. Then add the freshly ground masala and some salt and mix well with the masalas .We need to cook this until the gravy thickens and reduces. Step 5) Now you can see the gravy is nice and thick, add the cooked mutton pieces and mix well with the gravy.After mixing nicely cook this for sometime until the oil separates ( on a medium heat). Finally add some curry leaves for garnishing and turn off the heat. Our Delicious Mutton roast is ready to be served.I cannot wait to taste this awesome mutton Roast.If you want a gravy kind of thing then you can add the mutton pieces along with the broth at the end and cook for 5 minutes in the masala. Happy Cooking.